In August 2007, my sister Laura was murdered by her ex-husband in the home they shared with their two young sons. In an instant, her sons, ages two and four, became practical orphans, with one dead parent and another in police custody. The boys were shuttled through foster care at a time when they were fragile and confused, until Social Services could determine, with the approval of their only surviving parent, their father, where to place them on a more permanent basis. The situation required our family to fight the state of Colorado for five weeks until they were finally released to my parents in Seattle, Washington. 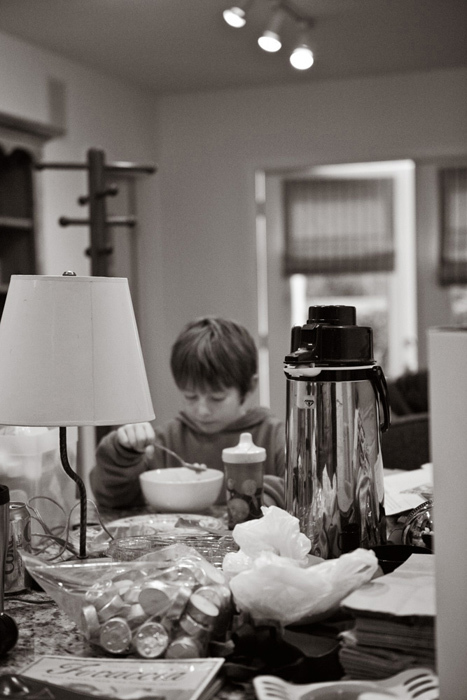 This documentary project began organically; a simple documentation of my nephews lives upon their arrival in Seattle. I now recognize that it also became a way for me to escape the grief that consumed me and crippled my creative work. I want to continue to document our family as the dynamic shifts and unfolds and ushers in revelations, celebrations, sadness and fear. And I hope that it is through this process, I will bare witness to all that my sister is not able to, and I will lovingly and truthfully capture those moments and people that mean so much to me. This is a work in progress, not unlike myself. Noelle Swan Gilbert is a Los Angeles, CA based artist.